I especially love sesame balls. 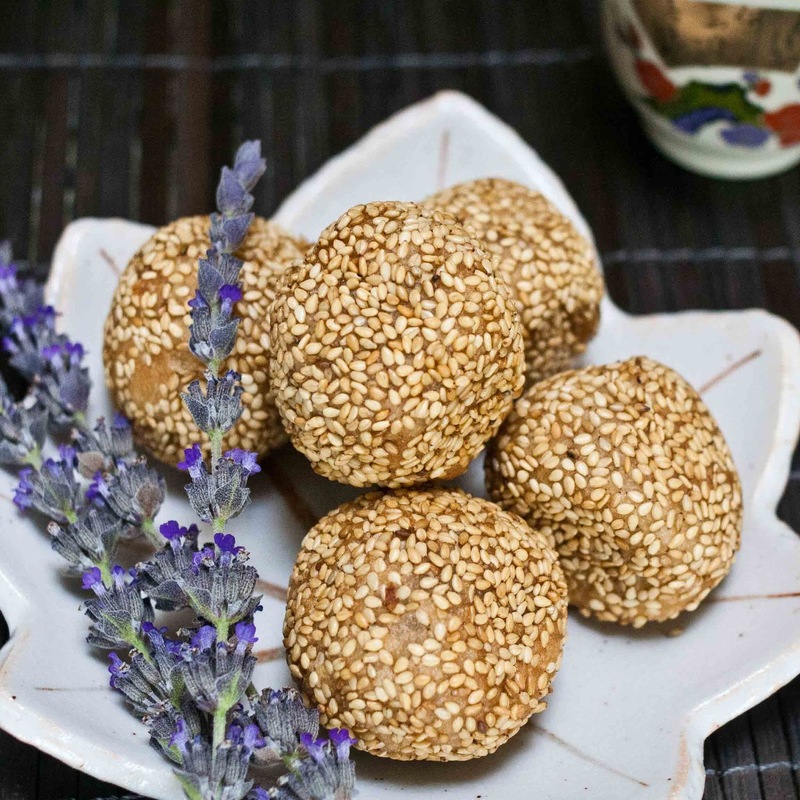 Crispy-crunchy sesame seeds with chewy mochi-like outside and sweet bean paste on the inside. 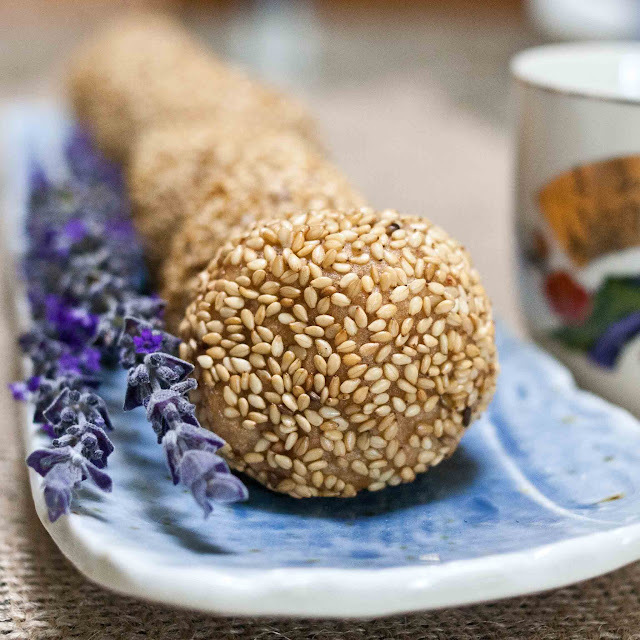 There are a lot of recipes online, it's difficult for a novice sesame ball maker to choose, so of course I chose the one with the best picture. Yum! Yum! I Eat, I Travel, I Sleep...Repeat! 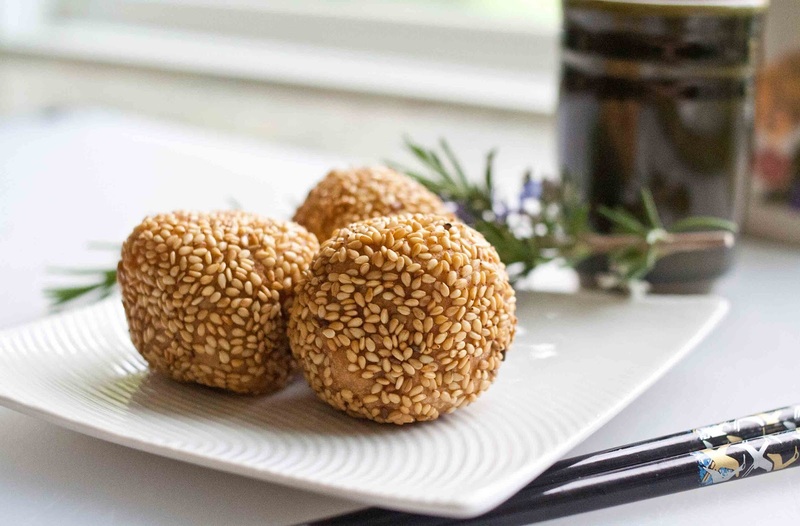 The sesame seed balls on that website look perfect. Here's what you'll need for the inside, I cooked the whole package of beans and put the leftovers in the freezer, but you can make less. 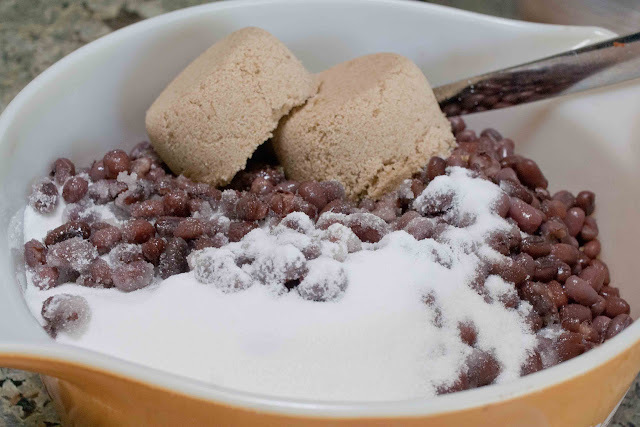 They also sell the beans already cooked and sweetened at Nijiya Market. I had these in my pantry begging to be used. 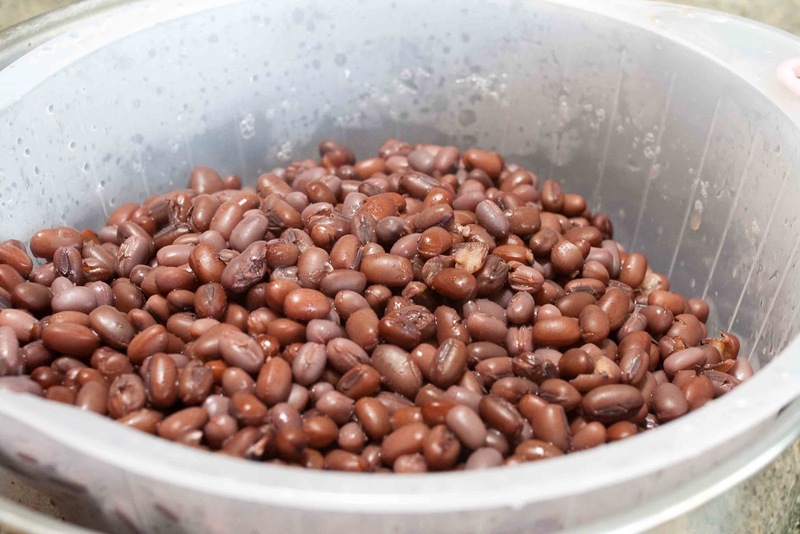 Rinse the dry beans and put them in a large pot. There were 2 1/3 cups of beans in this one pound bag. Cover them with water and let them soak overnight. Drain the beans and cover with water by a couple of inches, and bring to boil. Lower the heat and simmer gently for 1 1/2 to 2 hours, until tender. Transfer beans and sugar to a food processor and puree. Transfer to a pot, add oil, and heat over low heat until the mixture is thickened to a soft paste. Transfer to a container and set aside to cool, stirring occasionally. 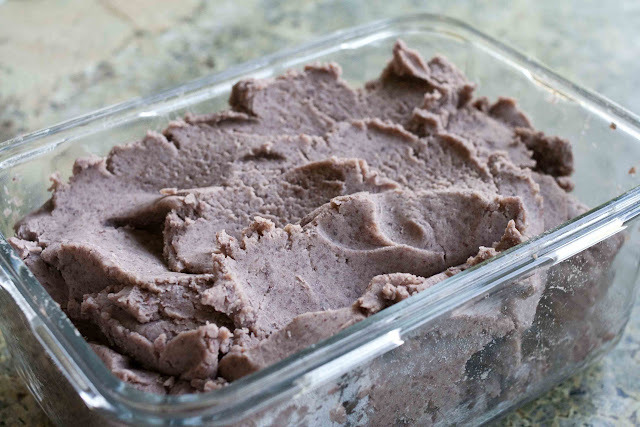 You can make this several days ahead of time, or keep it in the refrigerator for about a month. 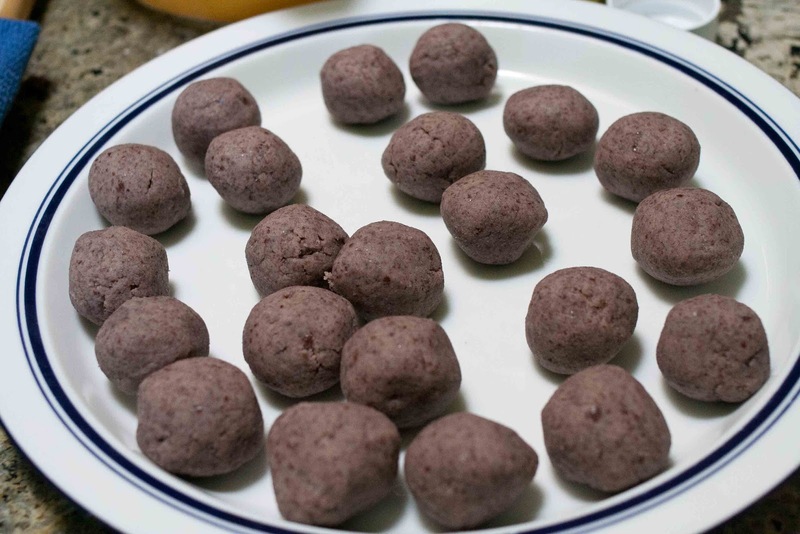 When you're ready to make the sesame balls, roll the sweet azuki bean mixture into balls, a generous teaspoon sized. 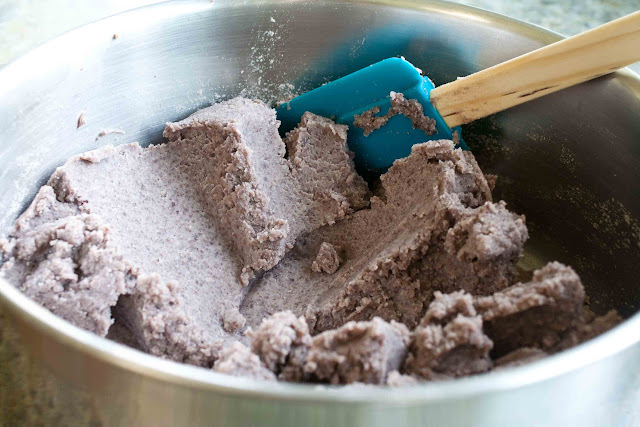 Use the same flour we used to make peanut butter mochi. Bring the water to a boil and add the sugar. Stir until sugar is dissolved. 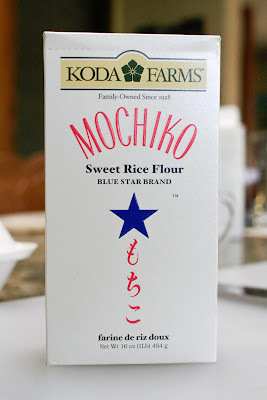 Pour into a bowl containing the mochiko and stir to combine. Form the dough into a ball and divide into 3. Roll into a log and cut into six pieces. Keep a bowl of water handy. 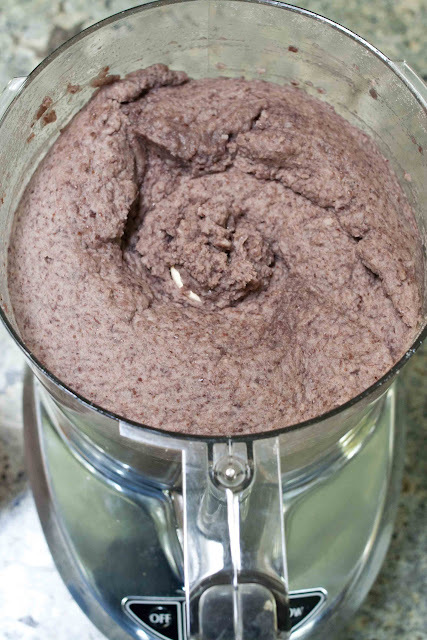 The dough tends to get dry, so you need to be constantly wetting your hands. 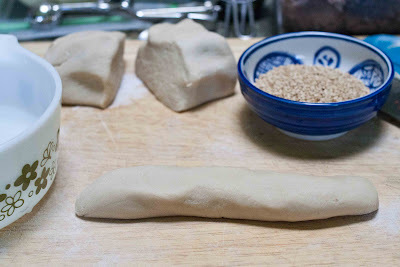 Flatten out a piece of dough. 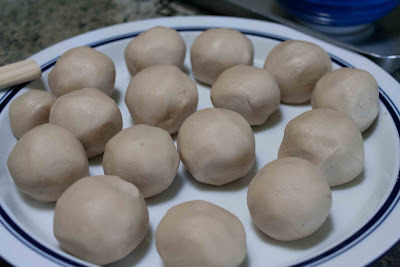 Cover the dough with plastic wrap to keep it moist. If you don't, you'll have to continuously keep dipping your hands in water because the dough will get dry. 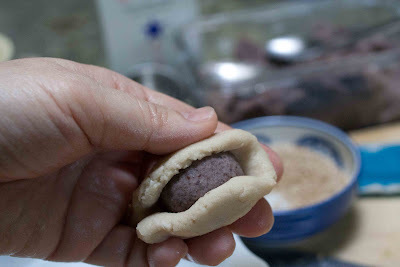 Add a ball of the sweet azuki beans. Cover the beans with the dough. Wet your hands and smooth into a round ball after you have closed the dough around the beans. 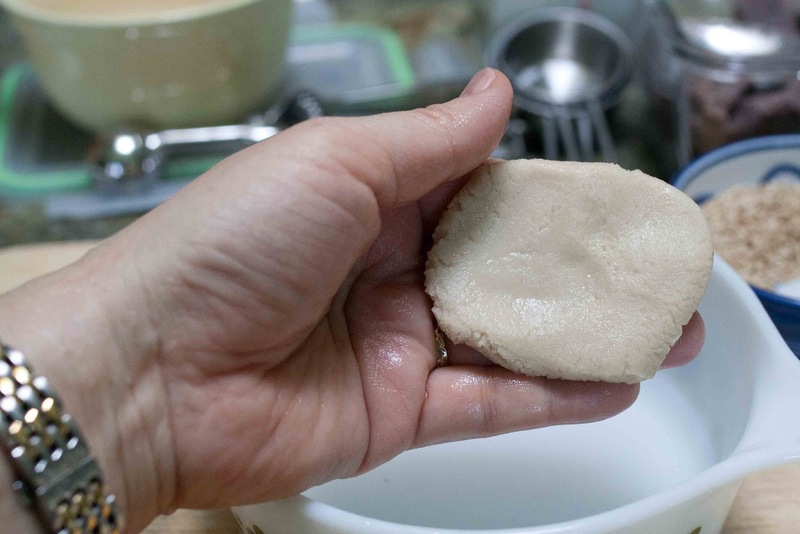 You can pinch off excess dough as you're making them, that way one side of the ball won't be overloaded with dough, and you'll have an even coating. Moisten your hands lightly with water and roll the dough. It would be fun to make them with friends, so you can have an assembly line to make it go faster. Chatting and giggling always make the cooking more fun. 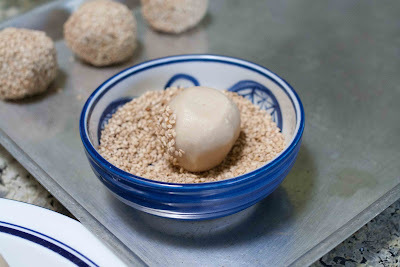 Roll the balls in sesame seeds, coating all around. These are the sesame seeds I used. I keep them in the freezer. 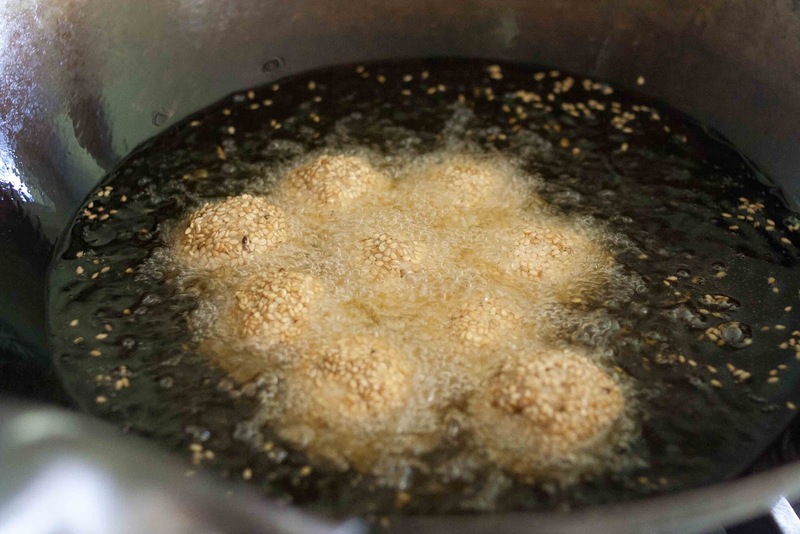 Heat the oil to just below 350 degrees F, add the sesame balls. After 2 to 4 minutes, they'll float to the surface. 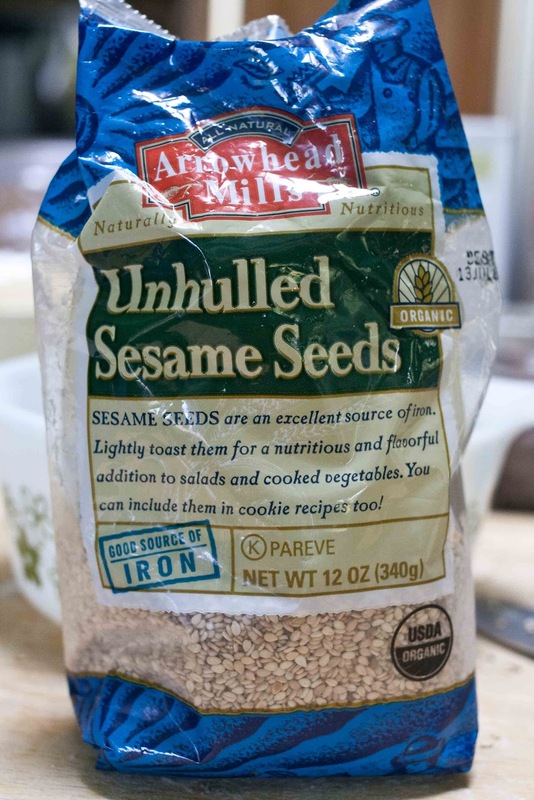 Then, gently press them with a long metal spoon and press them back into the oil, holding for a second or two. The balls will expand a little. Cook them a little longer until they're golden brown. The next time I make these, I'm going to make them with some friends. Then we'll all have them with a cup of tea when they're done. 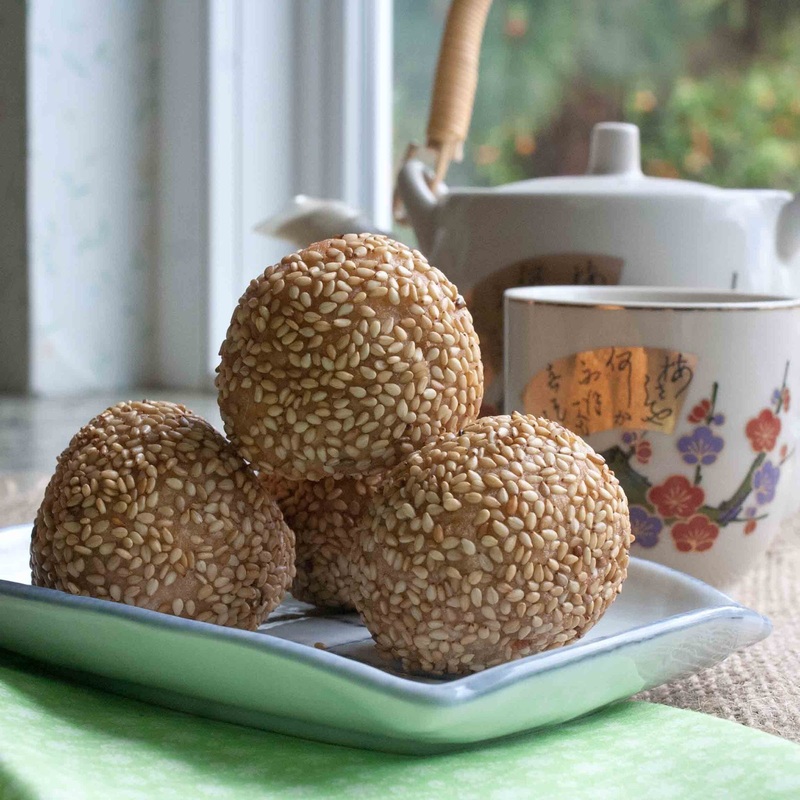 When I get good at making these sesame balls, I'm going to invite our friends Robert, Connie & Robert's mom, Mas, over to have some sesame balls and hot tea. This is our friend, Robert. If he had his way, this is the only picture of him I'd post. We've been friends for years and years. He's a big Dodger fan. I hope I'm as adventurous at 92 as Mas is. Robert goes camping with us every summer. If Robert, or his son Keith, can't go, we plan around them. When our daughter got married in a fun do-it-yourself wedding last year, we couldn't have done it without Robert's help. He came over and helped paint the house. Even when Gary had to work. He helped with the wedding preparations, helping stain the arbor and make the stage, hang the strings of lights in the trees, make the mason jar lights, stage the ceremony area, etc., etc., etc. Then he took a day off from work the next day to help us clean it all up. He's that kind of friend. 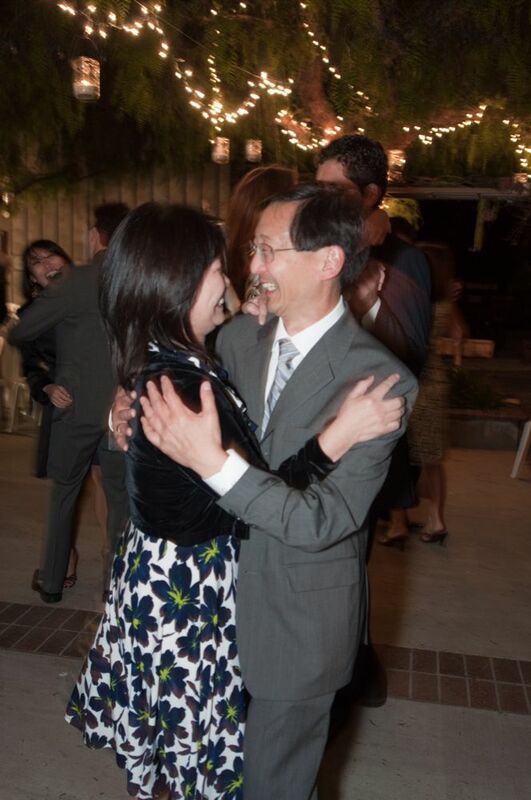 Here he is dancing with Connie at the wedding. We couldn't ask for a better friend. Bobby says I have to make these tomorrow. I may be calling you every 5 mins for help haha! Wish me luck! I love sesame balls, too! Never thought of making them at home! I like the idea of making them with friends--! These look fantastic! Found you on foodgawker and I love your easy to follow content. Thanks! hmmmm. James has a birthday this week. He loves sesame balls. 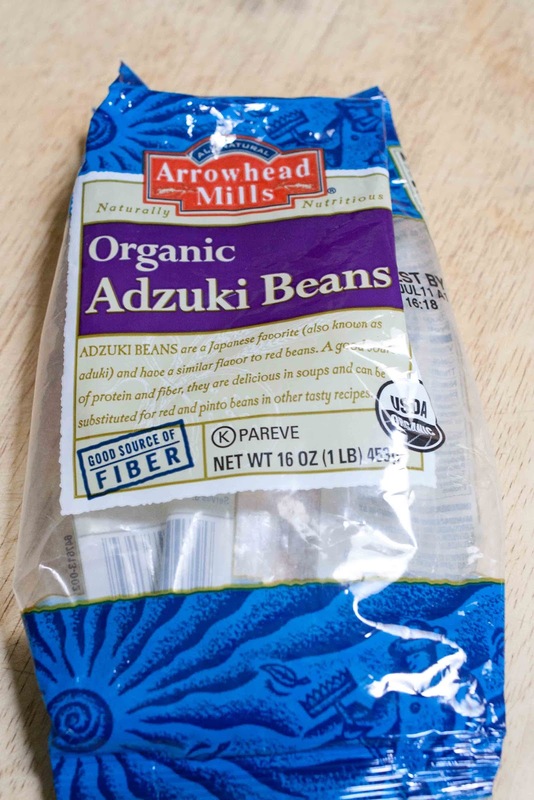 I have some prepared azuki beans. I love James.....but no. Too difficult for me. I'll have to come over to your house to try next time I'm in town. funny you posted this. i was just on the phone with my grandma (takemoto) the other night and i was telling her that after i made mochi inspired by foodjimoto, i wanted to go buy some azuki and make an-mochi or that semi-sweet azuki soup with little mochi balls in it. if you're on a mochiko kick right now you might also consider making the fried pork dumplings that are basically gyoza but with a sweet mochi wrapper and then are deep fried. also, lauren: you should come visit me in nyc. there are like 10 different bakeries that sell the custard tarts within walking distance of my house, and they have all different styles. mmmmmm. I ate these as a child!! I'm so glad I found your recipe! My husband brought some home from the Asian Wok deli in the supermarket he works at, but you can tell they were sitting awhile. Although they were still good, I know that fresher is best! 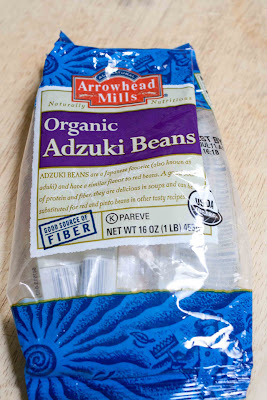 I am going to be making some as soon as I get the azuki beans. Thank you! 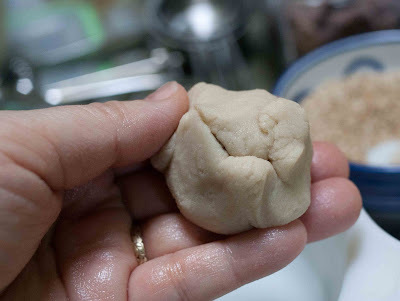 I followed your recipe and just finished the bean paste. It made so much more than I thought I would need! It seems like there's going to be more paste than the amount of dough this recipe calls for! How many balls does this recipe make?